Since 1994 Primary education has been free but not compulsory. Most children start formal education at primary school at the age of six and most of them will not have attended any pre-school education. The children attending primary school are generally between the ages of 6 – 14. Primary education takes 8 years (Standards 1 to 8) and falls in the category of basic education which is meant to equip children with basic knowledge and skills to allow them to function as competent and productive citizens in a free society when they grow up. The primary education cycle is categorised into: 1) the infant level which comprises of the first two years of formal school education; 2) junior primary comprising of the next three to five years; and 3) senior primary consisting of standards 6 to 8. Pupils who are able to reach standard 8 sit the Primary School Leaving Certificate Examination (PSLCE), which determines their eligibility for entry into secondary school. The PSLCE examinations are jointly set, conducted and marked by the Ministry of Education and the Malawi National Examinations Board (MANEB). Pupils have to pass well and get selected if they are to attend secondary school education in a government secondary school. The financing of primary education in Malawi is largely the responsibility of the Government. External donors continue to play a significant role in education financing, especially the purchase of teaching materials, equipment, and furniture and the building of educational institutions, their renovation and maintenance. All of Malawi's primary schools have been deemed Community Schools, which in effect places the community in a position of central partnership with the Government. Local communities and parents are increasingly playing a role in educational finance especially sharing in the cost of buildings and their maintenance, transport to schools, uniforms, learning materials and extra-curricular activities. Community participation is particularly significant at the primary level where more than 75% of Malawi's primary schools have been built with the support of local communities. Most children love to go to school. They are keen to learn and explore but they also need more guidance. The general behaviour of primary school children in Malawi is good and results in a high pass rate in the Primary School Leaving Certificate Examinations. Most of the children are willing to listen to their teachers and learn from them, but it is very challenging to teach and control a class of over 100 children and hence some rowdy behaviour still develops. Most problematic behaviour is seen in higher classes (e.g. standard seven and eight) where young girls have to dropout of school due to teenage pregnancies. Most of this also results from the fact that some children are starting school at an older age and therefore reach adolescence while still in primary school. Infrastructure: - Children have to learn under trees because there are more children attending primary schools and not enough classrooms to house the children. As a result children are being denied the chance to learn under normal conditions due to scarce resources e.g. desks, books, teaching materials etc. Children are also exposed to hardships beyond their age due to lack of classrooms e.g. cold, rain, and wind since most of them are learning outside. Hygiene: - Children have to live in an environment that has very poor sanitation, without proper toilets and clean water sources. Teachers: - The Government has made provisions that for every 60 children there is a teacher allocated but in most cases the teacher pupil ratio is higher. 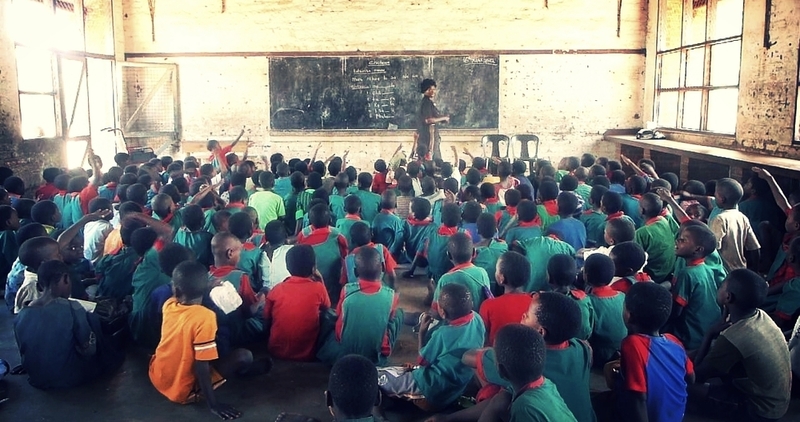 To help manage the many primary schools in Malawi, the Ministry of Education has created Education Divisions which group primary schools into smaller groups for management purposes. The schools that Starfish Malawi are linking are in the Central East Division in central Malawi (Kasungu, Salima districts). At a community level, local school management committees are responsible for school operations and for reinforcing effective learning. Village schools are situated conveniently within villages, making parents less fearful for their children’s safety en route to school. Only primary education is free in Malawi. Secondary education has to be paid for. Secondary education begins in Form 1 and ends at Form 4. Technically, a student could end secondary school at age 18 if he or she never has to retake a school year. This is rare. In the school year 2013 – 14 out of a class of 100 Form One learners at Malowa Community Day Secondary School, there were only three students who were 14 years old. A = Excellent, B = Very Good, C = Good, D = Average & F = Fail. 1 = distinction, 2 = distinction, 3 = credit, 4 = credit, 5 = credit, 6 = credit, 7 = pass, 8 = pass & 9 = fail. The teachers are moved around by the government or recommended for posts by the head teacher. The head teacher is able to make recommendations for promotion once a teacher has proved his ability to take on further responsibilities. A teacher with a degree earns from 80.000 kwacha a month (approximately £133). Teachers who only have the MSCE would earn considerably less. Head teachers could earn up to 120.000 kwacha a month (approximately £200).